The patient, who had been tilting her head up to look at me from beneath her wet hair, moved with sudden speed, pulling herself from Nurse Heather’s grasp. She grabbed my arm and yanked us both to our knees. I found myself gazing into a single golden-brown eye, bright as it gave me a gimlet stare. The rest of her face was obscured by her hair. Before I could pull myself from her, she shook her head, violent and distressed. '"You must help her. You’re the only one who can." Order your own copy of To Fight the Black Wind at your local retailer or online through our website today! Psychologist Carolyn Fern may be facing the most difficult case of her career when confronted with a patient who does not want to be cured. Josephine Ruggles suffers from violent nightmares that leave strange wounds on her back. But when Carolyn Fern attempts to address her trauma using hypnotherapy, she finds herself transported to the mysterious Dreamlands. Here, she will confront a menace that threatens not only her patient, but the entire waking world. Help defend an innocent life and add four new cards to your investigations in Arkham Horror: The Card Game with To Fight the Black Wind, the new Arkham Horror novella by Jennifer Brozek—on sale now! Carolyn Fern’s latest patient, the heiress Josephine Ruggles, suffers from a self-harm complex, claiming to experience nightmares that leave her wounded and bloody—a curious case, even for a place like Arkham Sanatorium. A closer examination of the young lady’s skin reveals an alarming detail. The wounds appear to be some form of strange glyph-like writing and worse, they appear to have been pushed out of her skin, which is simply not possible. In an attempt to understand her patient’s dangerous mind, Carolyn attempts hypnotherapy… but rather than drawing out Josephine’s subconscious, the session pulls Carolyn into the Dreamlands, a world beyond human comprehension where cats can talk, and your thoughts have the power to manipulate the world around you. Here, the two women must unite to confront a dark entity more dangerous than anything the doctor could have imagined. And even worse, the more Carolyn tries to protect the world, the more she puts her patient in danger. 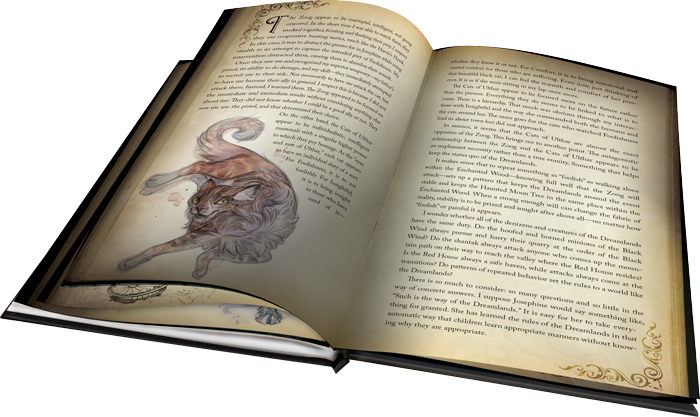 Beyond the story, To Fight the Black Wind offers readers a further level of immersion with fifteen pages of full-color inserts, including Carolyn’s personal journal that she kept while investigating the case and several newspaper clippings that may provide the details she needs to understand Josephine’s case. Perhaps the key to understanding Josephine’s ailment and saving her life can be found within the lines of these pages. 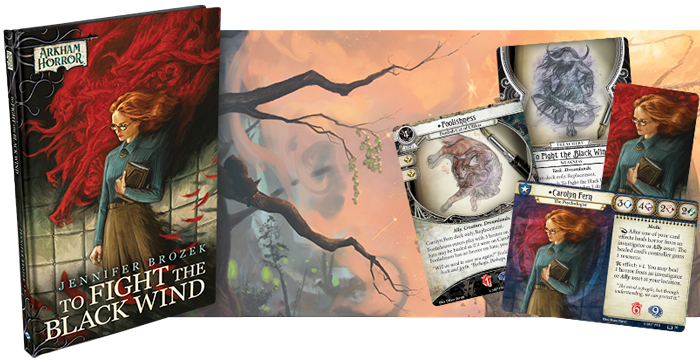 To Fight the Black Wind marks Carolyn Fern’s first introduction to Arkham Horror: The Card Game with four new cards, including her investigator card, mini card, and signature asset and weakness. 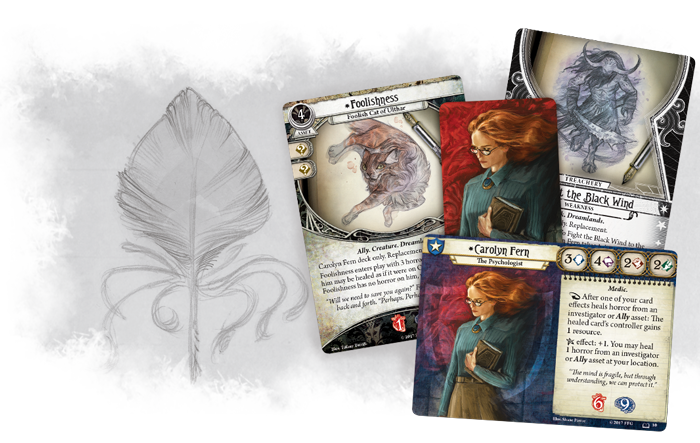 While Carolyn will enter Arkham Horror: The Card Game in a later expansion of the game, this novella is the only place where you will find her unique Replacement cards. In her mission to protect her patients, Carolyn Fern is a member of the Guardian class. However, as a psychologist, Carolyn battles with her mind, not her fists. She does not seek to destroy her enemies, but to protect her allies, using her skills to fortify the minds of her fellow investigators against the maddening world of the Mythos. Carolyn’s elder sign ability allows her to heal a horror from a nearby Ally or investigator. 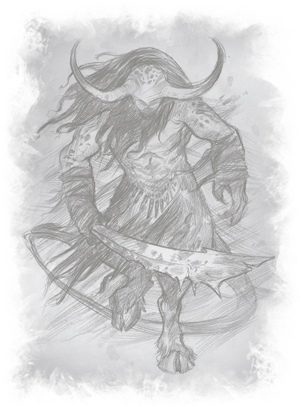 This, combined with her ability to give a resource to a player after she has healed an investigator or Ally under their control, encourages players to reexamine the Guardian class and discover a new way to play as this powerful faction. Rather than taking the fight to monsters head-on, Carolyn strengthens her entire team and focuses on keeping them all safe. As she normally acts as her team’s keeper, Carolyn’s signature weakness, To Fight the Black Wind (To Fight the Black Wind, 12), affects the entire team of investigators. When To Fight the Black Wind is revealed, the Task is attached to the current agenda. Not only does this treachery force Carolyn Fern to immediately suffer one direct horror, it continually adds doom to the current agenda at the end of any round where she fails to heal the minds of her fellow investigators. Carolyn is not the only valued friend that you will find in To Fight the Black Wind. To journey beyond the world of the familiar into the world of dreams, you will need help from one who knows what mortals were never meant to understand. 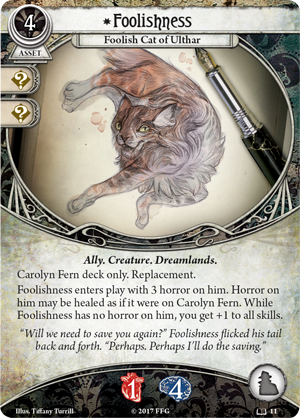 Foolishness (To Fight the Black Wind, 11), the foolish cat of Ulthar, enters the game with three horror on him, which Carolyn must quickly work to heal before his sanity runs out. Once her mission is complete and her Ally has been freed of his madness, Foolishness returns the favor by increasing each of Carolyn Fern’s skills! In a world where there is no way out for the doctor, this boon may prove invaluable. When an innocent life is placed in your hands, you cannot simply turn away. No matter where you go, there is no escaping your own mind. You can, however, protect it. Help Carolyn Fern defend her patient and uncover the madness that resides within the Dreamlands! 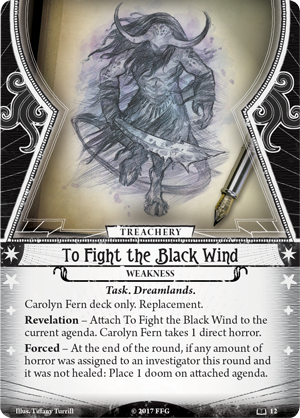 Pick up your copy of To Fight the Black Wind (NAH14) at your local retailer or here on the Fantasy Flight Games website today!